At the heart of each client relationship is a fundamental commitment to helping you achieve your life goals. Whether you are investing for your children’s education, an early retirement or other life goals, Hudock Capital offers the advice, experience, and guidance to advance your goals toward reality. Gaining a clear understanding of your life goals is the first step. We will spend the necessary time getting to know you, your interest, preferences and values. Once these are defined and your goals understood, we can start developing your plan. We will work with you to create a customized plan to help you achieve your financial goals. The plan is built on a sound strategy that incorporates your needs, time horizon, and risk tolerance. Once your plan is established, we recommend custom-tailored strategies and coordinate specific recommendations with your other professional advisors as needed. Together, we select from a broad array of investment vehicles and services, and implement the strategies that make sense for your situation. Throughout your relationship with us, we will communicate with you regularly to assess your progress. This ongoing evaluation helps ensure that your needs and expectations are being met. Recommendations and strategies are adjusted over time to address your evolving goals and changes in the markets. 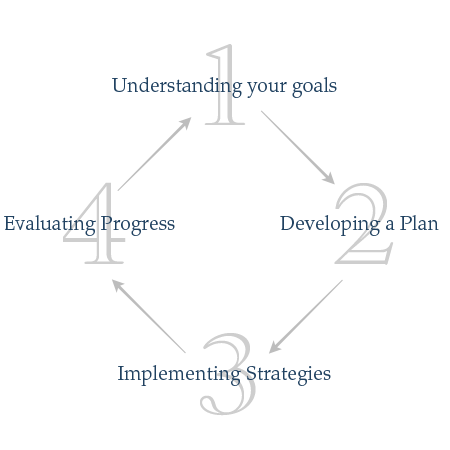 At Hudock Capital, one of our strengths is our belief in the investment planning process. While not all of our clients need a written, comprehensive plan, we believe everyone can benefit from planning. This process evolves with annual reviews and updates to stay current with each client’s life-stage needs. Investment planning services are also provided to address specific goals and needs. The first phase of your planning process takes into account any special circumstances, such as non-liquid assets, business ownership or transition issues. The second phase entails monitoring of overall holdings, target allocation and related performance, and needs such as cash flow, Social Security Optimization, liquidity and tax minimization. Asset allocation/investment timing cannot eliminate the risk of fluctuating prices and uncertain returns. Hudock Capital associates are not legal or tax advisors. However, we as Financial Advisors will be glad to work with you, your accountant, tax advisor and/or attorney to help meet your financial goals. After the initial planning process is complete, a target return is established. We then develop an Investment Policy and an Asset Allocation Strategy. Investment selection is the final stage of the investment process. Portfolio assets are allocated among the major classes of cash, stocks, bonds, real estate and other alternative asset classes, such as commodities, based upon market conditions. Stocks are divided among domestic and foreign, large and small capitalization. We further divide domestic stocks into growth and value styles. Bonds are separated by investment quality, taxability and duration. In addition, we may use real estate investment trusts (REITs) for the real estate component of a portfolio to complement the client’s investment property holdings. Using the Investment Policy created as our guide, we will implement, manage and monitor performance regularly. One of the greatest challenges facing any investor is determining the blend of assets of the portfolio; a blend that is intended to achieve the investment objectives for the portfolio while still exposing the investor to a level of risk he can tolerate both personally and financially. In addition, while tax considerations do not drive our portfolio management decisions, we exercise care in the appropriate placement of investments within tax-deferred and taxable account structures. Quarterly Tax Tip: Tax-Free Growth AND Tax-Free Withdrawals Anyone? Hudock Capital Group, LLC is a Registered Investment Advisor. Certain representatives of Hudock Capital Group, LLC are also Registered Representatives offering securities through APW Capital, Inc., Member FINRA/SIPC. 100 Enterprise Drive, Suite 504, Rockaway, NJ, 07866 (800-637-3211). It is not known whether the clients appearing on this website approve or disapprove of Hudock Capital Group, LLC, or the investment advisory services provided. Clients appearing on this website were chosen at random; account performance was not a consideration for selection.